Several customers, a High Court Marshal, lawyer and policeman were Tuesday afternoon among several persons locked inside the New Building Society (NBS) headquarters for several hours, raising concerns about alleged false imprisonment. 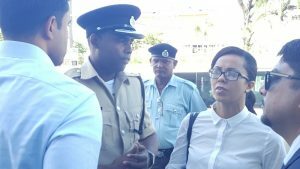 Deputy Commander for ‘A’ Division of the Guyana Police Force, Senior Superintendent Wendell Blanhum said legal action was being contemplated. Blanhum told NBS lawyer, Ashton Chase that he viewed the matter seriously and urged that a Director be contacted to open the door. The doors have been closed since about 12:15 PM Tuesday when High Court Marshals arrived at the mortgage institution to enforce a High Court order issued in December, 2017 in favour of former NBS official, Maurice Arjoon who the court found was wrongfully dismissed 12 years ago. Up to 3:17 PM the doors were still closed. After NBS failed to pay Arjoon GY$59 million, the Marshals and his lawyers swooped down to seize NBS’ assets. One vehicle has been carted off so far. Attorney-at-Law Chase told reporters that an application has been filed for a stay of execution and it is only courteous that Arjoon awaits that outcome. His lawyer, Sanjeev Datadin, however, said there is nothing blocking the enforcement of the levy.